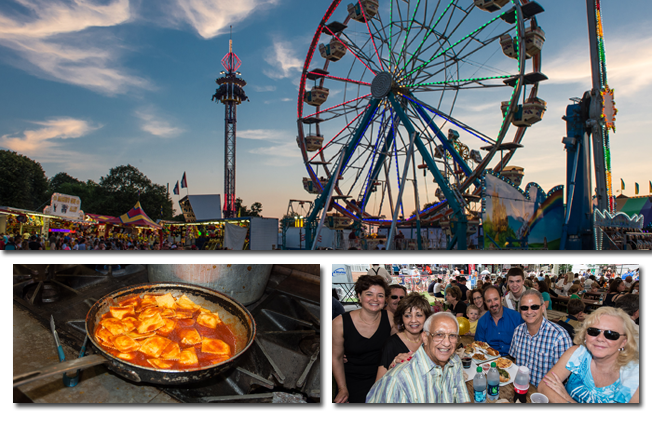 The annual Italian Festival draws tens of thousands of people to Wilmington with rides, nightly entertainment and lots of food. What to eat: You&apos;ll find homemade spaghetti and ravioli and pizza, all of which is very good, but look past the staples to find those Festival only gems that you won&apos;t find elsewhere. Panzarotti, a deep fried calzone-like device filled with sauce and cheese, has been a festival staple for decades. (Don&apos;t bite into it first thing out of the fryer, or you will bear the rookie mark of the burned chin.) Seek out the Cafe Antonin for a sandwiches, and go with either the porkette or the spezzato (veal, mushrooms and peppers), and then top it off with a visit to my favorite booth, La Piazza, with the delicious fried smelts (my personal must-have every year, but maybe not for everybody), broccoli rabe and fresh olives. Italian desserts are everywhere, but on a hot day, I usually can&apos;t pass up some gelato from the Caffe Gelato street booth. (Can&apos;t choose? They&apos;ll combine more than one flavor in a dish, no problem.) Tips: Even for locals, parking can be a confusing nightmare. If you go early, you should be OK, but in primetime, take advantage of the free shuttles from Salesianum School at 18th and Broom. Taste the wines of the Brandywine Wine Trail, without all that pesky driving. What to drink: Pours from Black Walnut Winery, Borderland Vineyard, Grace Winery, Kreutz Creek Vineyards, Paradocx Vineyards, Patone Cellars, Penns Woods Winery, Stone Barn Cellars Winery and Ten Gallon Hat Winery will give you a good feel for the kind of wines being made in the area. Some other vendors that will give you a taste of the area: Amani&apos;s BYOB often pops up at the top of best BYOB lists in Chester County, an area where the bring-your-own-bottle culture thrives. Kilby Cream is a Maryland dairy farm that not only make their own ice cream, but they&apos;ve brought back the milkman with home delivery. And Farm Fromage will give you a solid taste of the Lancaster cheesemaking scene. Bonus: Check out the suddenly very-relevant-to-Delaware demonstration from the Chester County Beekeepers Association. This celebration of Chinese arts, history and culture also boasts an impressive spread of Chinese dishes in the food court inspired by homey street food. Last years menu included scallion pancakes, dumplings, BBQ pork buns, Taiwanese sausage, bubble tea and much, much more. And you can wash that down with a Chinese beer. Yes, the festival is full of frosty treats, but man cannot live on ice cream alone, which is why the Ice Cream Festival also stocks itself with a bunch of local restaurants and food vendors for a day of family fun, music and not sipping dessert. What to eat: Restaurants and vendors tend to turn over from year to year, but my favorite from last year was the sweets put out by UD Creamery, the on-campus, student-managed, why-the-hell-didnt-we-have-one-of-these-where-I-went-to-college ice-cream shop at the University of Delaware. Here&apos;s hoping they return with my favorite from last year, Flavor 1923 (in honor of the 90th anniversary of UD&apos;s Study Abroad Program), with its French Vanilla flavored ice cream with bittersweet chocolate chunks and salted caramel swirls.